NWC Board Chair, Nada Larsen, and I visited with community members in Meeteetse to hear how NWC can better serve their community. We also met with Superintendent Shane Odgen to discuss educational opportunities for Meeteetse High School students. 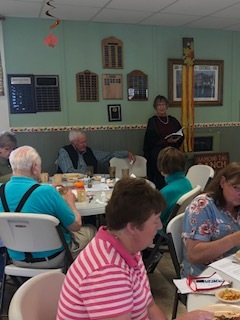 One of the highlights of the day (besides the trip to the Chocolatier) was lunch at the Senior Center where Mary Budd Flitner did a reading from her new book, My Ranch Too. Park County is our home. We use the hashtag #WeAreParkCounty to give a shout-out when we come together with our neighbors and to celebrate each other.